From the start the home side were on the front foot, and Chelsea really struggled to get out of their half in the opening ten minutes. The team, playing without a centre forward, looked really unable to get themselves up the pitch, and that in turn drained their confidence. If it hadn’t been for a superb block off the line from Cesar Azpilicueta, the Blues would have found themselves behind, having barely mounted a single attack. The last few minutes of the half saw the Blues get forward a little more, but they still looked totally blunt without a number nine. After all that hard work, there were a hope that Chelsea would change things at half time and battle their way into the game, but that was extinguished after moments of the second period. Bernardo Silva slid the ball home after 34 seconds, with 44 minutes of the game left for Chelsea to suffer. Chelsea weathered the storm for a while, and Antonio Conte resisted the temptation to throw on a striker until the 78th minute, much to the annoyance of many Blues fans. Even as City energy ran out, Antonio Conte’s men looked short of confidence and barely put up a fight as the second half drew to a close. 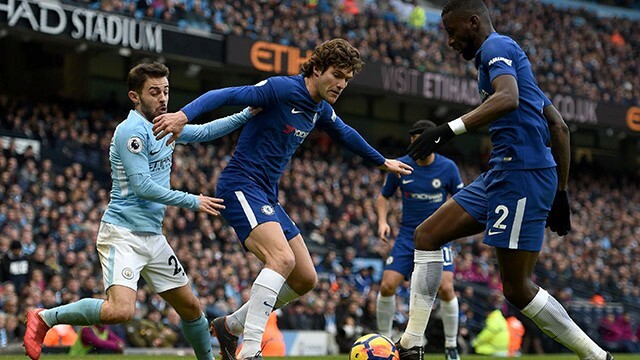 It’s a disappointing result and for the second game in a row against City, the Blues were beaten 1-0 in a game where their opposition utterly dominated the play.